Show off your fruity side in this deluxe banana suit! The funny adult costume features a bright yellow banana suit made from poly foam. It has a 3-D appearance with both the top and bottom featuring a black stem for a realistic look. The full-length suit features a hole for the face as well as slits for the arms and an open bottom. 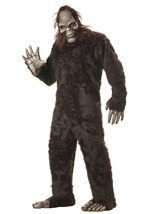 Get a deluxe gorilla costume too and you'll make a hilarious duo for Halloween!